Take a seat and start earning from you chair. paid surveys, trivia, affiliate programs, PTC, GPT, investments, btc and all about earning online, work from home, extra money to your wallet. Today, I took a little of a different topic and write a few words about the site Popads.net. The company has been on the market for many years and there are not too many competitors in this field. What I mean here is mainly the ad system it offers, because, in terms of the profitability of advertising on various genres, blogs are still and probably will be AdSense. 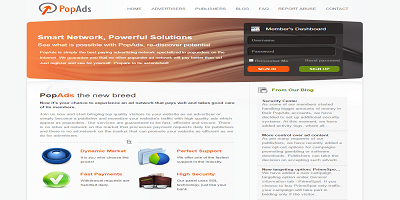 PopAds is a network that pays its publishers for clicks on websites. It counts clicks from anywhere on your site and you need not put any banners, sliders or others on them. This is one of the better sites, which does not reduce the conversion and earnings of Google AdSense so terribly. Clicking opens the so-called Pop Under under the open browser window on your computer or a new window with advertising on mobile devices. By default, the ad only starts once on the first click. After refreshing the page will launch again after the first click. You can change this and run the ad every few days for the same person. Unfortunately, I have never checked this solution. To earn money on this site you need to register your account and then add your domain (s) on which you want to earn. Domain approval usually takes about 24 hours - usually, the next business day after it adds the domain, they will accept it. Here, a small staircase begins, we must first determine whether it will pay off in the long run. This advertising gives you a good income, but they have one small annoying problem - not for us, for the person who visits the website. Pop-ups are bothersome, in addition, if we set up you want to open them several per one person is macabre. If you run a website whose content will bring a user to you anyway, no problem. However, if there are many blogs on similar topics as yours, then you have nothing to fear. It's simple, maybe you'll write interesting and interesting things, but so what if you have a choice will probably skip your website with a wide berth. There are, however, some themes of the parties, for where on each page there is this advertising. Have I ever looked at warez or torrent sites? Most of these types of advertisements are not like all. Someone will not make money on one, he must do the other. We have three payment methods available - PayPal, Payoneer, Wire. The minimum withdraws amount is $5.00 for PayPal, $20.00 for Payoneer, and $2,000.00 for Wire transfer. In addition, there are no fees when paying funds, the minimum as you can see also is low because of only $5 for PayPal which is great news. If we run a small website, we do not have to collect money all year long so we can withdraw it. Before writing this sub-section I looked at my uncle Google, out of curiosity, I used to look for information about this advertising; I mean - Popads, popunder and so on. I found nothing. I checked it on my skin and the situation depends on how we set up our own campaign because we have a multiple choice here. We can set a list of recipients - countries on which websites we want our ad to open, how many times a person will see our advertisement or the daily budget to promote our site. What is the effectiveness of popads / popunder ads? This sometimes depends on what we advertise and so on, for example, if we want to promote your blog, we should remember that the advertisement should only display on pages with similar themes. I also do not recommend adding the main page to the ad, just an interesting post that will interest the visitor. It should also remember that the site has to be an eye-catching, as this advertising is often closed by users immediately after opening. If you add nothing interesting and mis-configure the ad, it will be money spent in vain. At the outset, I would like to say I have not forgotten about adding rates because they are variable and I do not want to provide old information. In addition, I rather do not write on the daily editing of the post. I recommend setting up an account to test a few days and draw conclusions.